The Atlanta Foundation for Public Spaces will bring art to the streets of Sandy Springs during this two-day celebration of self-taught art and crafts. In addition to approximately 125 artists will be a children’s area, local musicians, gourmet foods and interactive art activities for all ages. The event will be held on April 20-21, 2019. 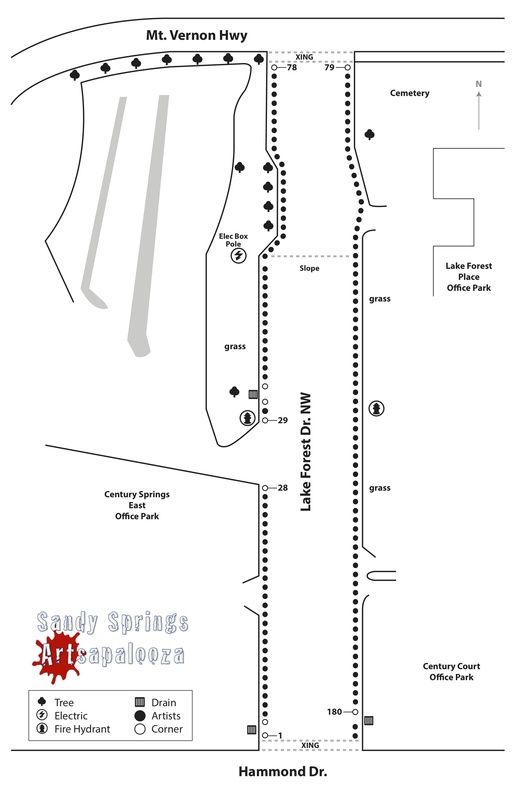 The festival location is in the heart of Sandy Springs, near interstate access and all things Atlanta. Free to attend. Cancellations by confirmed artist participants must be received in writing before 5:00 p.m. thirty days prior to the event for a refund of booth fee. Application fees are non-refundable. By applying you understand that this is a legal binding agreement and as such, understand that the Festival is a rain or shine event. Additionally, a $50 Administration fee will be applied to any refunds that are made. Cancellations must be made submitted in written form by mail or email before 30 days prior to the event. By mail: send to P.O. Box 422571, Atlanta GA 30342. By email: to info@affps.com. No refunds will be given for cancellations less than 30 days prior to the event date or for no-shows. All refunds will incur a $50 admin fee, as our agreement with Zapp. - A holder of the only Guinness World Record by any arts festival organization in the U.S.
Free parking will be available at the event venue for artists and festival guests. A wait list will be maintained. Selected wait-listed artists may be contacted when the "Wait List" is released through one day prior to the event date. Artists who have not checked-in and/or called the Festival Emergency Number ( the is number will be available in confirmation materials) by Saturday at 8:00 a.m. will be considered a “no-show.” No Show artists are not eligible for refunds. Assigned space(s) will be forfeited to a wait-list artist. Artists are responsible for collecting and reporting Sales Tax. A Sales Tax reporting document is provided to participating artists at check-in at the event. The current Sales Tax rate for this event is 8% (Georgia 4%, Fulton County 8%). 5. The Festival is a rain or shine event. Cancellations must be made submitted in written form by mail or email before 5:00 p.m. thirty (30) days prior to the show. By mail: send to P.O. Box 422571, Atlanta GA 30342. By email: to info@affps.com. No refunds will be given for cancellations less than 30 days prior to the event date or for no-shows. 10. Artists must be present and operational with their work for the duration of the Festival. No commercial agents, dealers or salespeople may operate an artist's booth. The maximum number of occupants per booth may not exceed two. 12. Only individual artists or two-person collaborative artists are permitted to submit an application. Applications received from artist groups will be returned or rejected. Artists will be able to unload near their booth during set-up and tear down. Artists can load-in only during the designated times (Friday evening prior to the event) and must check-in with a photo ID. The lanes of traffic where the festival takes place are only wide enough for one vehicle on each side. Therefore, we depend upon artists’ cooperation to keep traffic moving at a pace that will allow everyone equal time to set-up. We ask that upon arrival at your booth location you unpack then move your vehicle before you start set-up. Artists will be responsible for hand carting in additional merchandise after the designated load in time. By applying online or signing a written application, you agree to indemnify, hold harmless, and defend the Atlanta Foundation for Public Spaces and the Georgia Foundation for Public Spaces dba Sandy Springs Artsapalooza and all of its officers, employees, servants and agents, against any and all liability claims, cost of whatever kind and nature, for injury to or death of any person or persons and for loss and damage to any property (State, County or other) occurring in connection with or in any way related to or arising out of the occupancy, use of premises or providing of services and equipment at the Festival. ​By applying you understand that this is a legal binding agreement and as such, understand that the Festival is a rain or shine event. Cancellations must be made submitted in written form by mail or email before 30 days prior to the event. By mail: send to P.O. Box 422571, Atlanta GA 30342. By email: to info@affps.com. No refunds will be given for cancellations less than 30 days prior to the event date or for no-shows. All refunds will incur a $10 admin fee, as our agreement with Zapp.